Actress Emilia Clarke, best known as Daenerys Targaryen from “Game of Thrones,” debuted a fresh new haircut for the world premiere of “Terminator Genisys” held in Berlin, Germany on Sunday, June 21. Hairstylist Alex Polillo for Redken 5th Avenue created a sense of glamorous ease on Emilia with a natural, luxurious hairstyle with the help of Redken products. “We wanted to show off Emilia's new haircut with a chic, soft, and full style. The look was inspired by the Dior girl … very French, very pretty but with an ease, ” said Alex. Step One: Spray Pillow Proof Blow Dry Express Primer all over clean, damp hair and comb through. Step Two: Apply a small amount of Full Frame 07 Volumizing Mousse at the crown and work the rest through the ends. Step Three: Taking small even sections, blow-dry hair from the top down, using a round brush to create volume. Lightly tease the crown for a little bump. Step Four: Spray Pillow Proof Blow Dry Two Day Extender Dry Shampoo at the roots to help expand the hair and create more shape. Start with a small amount and add more if needed. Step Five: Create one brushed-out wave at the front to complement the shape of the face, and then finish with a small amount of Rough Paste 12 working material and Quick Dry 18 Instant Finishing Spray. Step Six: For extra shine, mist Diamond Oil High Shine Airy Mist all over hair. 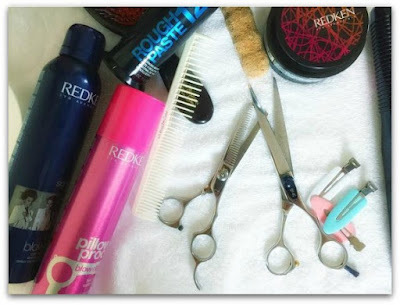 Redken products can only be guaranteed authentic when purchased from a salon. To find a salon near you, visit Redken!